I have uncovered something that some people may or may not care about, but it is worth mentioning about the fact that QNAP says they can do hardware transcoding in certain devices. In particular I purchased a TVS-671 which boasts this claim. Now I am also using Plex Media Server which currently does not take advantage of the built in hardware transcoding. I have however, been experimenting with using the automatic transcoding to create dual versions of files that Plex can see and serve up potentially reducing the software transcoding CPU usage. That is until I discovered that QNAP hardware transcoding does not actually work on any MKV files that are multi-channel. What you need to know is that hardware transcoding is not “automatic”. You need to install a software package called CodeX Pack, which seems counter intuitive for “Built-in” hardware transcoding, but whatever. 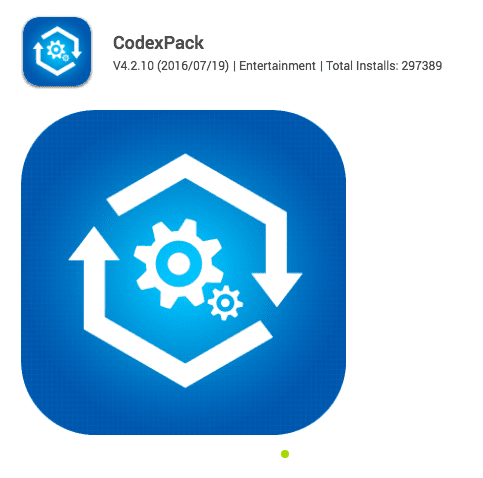 At first it worked fine until an update came for CodeX Pack 4.2.10. After digging around the forums it was mentioned this is not any technical issue, but rather a licensing issue that QNAP appears to not want to pay for. The functionality was removed intentionally by QNAP due to licensing reasons (based on our understanding). Unless QNAP decides to change their position in terms of licensing, or offers some option to purchase the license on an individual level, the functionality is not likely to return. I have downloaded and tried both the 4.3 and 4.7 versions and both seem to work. You will just always see the ‘Upgrade Available’ for the package which will bump you back to 4.2.10. The best way to replace this is to remove the 4.2.10 package then install one of these new. I’ve also put copies at these direct locations as well for QTS 4.2.2. Essentially, this claim of hardware transcoding is false. The fact is most people with media files most likely have AC3/DTS encoded files they are trying to transcode. There are people that are running QTS 4.3 Beta and have also verified the functionality is gone. So according to QNAP support you if you want to keep any kind of hardware transcoding you can not even go to QTS 4.3 when it becomes available. So there may or may not be a lot of people using this, but it’s something that QNAP advertises heavily AND more importantly it’s not not even something that Plex could leverage in the future on these devices. That I think is even more upsetting. There was posts that Plex was testing integration to use the hardware transcoding feature as they are doing it in other devices. By QNAP refusing to license something for DTS/AC3 they have essentially killed that potential integration. Is the problem solved at QTS 4.3.3. Fix not working. Help please. My TS451+ is running QTS 4.3.3.0188 (20170516) which QNAP wants to update. Early 2017 I installed CodexPack 4.3.0.1 to get back full transcoding capability. This has worked fine and has “survived” some QTS updates. Still I’m afraid I will loose transcoding through new QTS versions. Is it “safe” (transcoding-wise) to keep updating QTS? Is it unsafe (generally) not to? Plex has hardware transcoding if you need it, will work on QNAP. but is plex pass users only as far as i know for now. Plex by definition is 100% software transcoding within the application. It does not leverage any hardware transcoding capabilities except in very few devices like the NVidia Shield. The fact QNAP has completely buggered they HW transcoder does not even make it possible for PLex to leverage it and it will thus remain done in software even in a box that has hardware transcoding support for better performance. If you read the date this was posted it has only recently changed. Yes it does work with Plex Pass and the latest QNAP update, BUT you also have to completely remove the native QNAP transcoding package. Also it is still valid that the native QNAP package STILL will not do hardware transcoding of MKV files. So Plex has solved the problem, but you cannot run both the Plex HW transcoding and the QNAP package together. If you do not remove the native QNAP CodeX Pack the Plex option does not even show up. So depending on how you look at it it sort of works based on the way you want to use it. People that want to use the native CodeX Pack with MKV files still are out of luck. It’s disappointing about dts/acs but that was a licensing issue which why it was removed. synology also did not bother renewing that last i checked either. only solution is uninstall codexpack, then use plex pass to access quicksync hardware acceleration for use on qnap (works only on Intel cpu fyi). I noticed that Emby had a Nvidia NVENC under hardware acceleration option, but when i asked Luke he said the ffmpeg compiled does not have the NVENC library so hence it won’t actually work despite emby supporting it unfortunately. Not saying your wrong about codexpack not working perfectly, but many of us have moved on to plex pass if hardware acceleration (quicksync) is needed just fine without much fuss. i wouldn’t hold my breath about waiting for dts/ac3 licensing to get resolved, because most likely it won’t. and as for the Kodi removal issue, father mande already released a qpkg for installing it in HD station (still in alpha/beta stages). another problem resolved. Anyone know where I can download CodexPack 4.3.0.1 as upgrading to 4.5.0 caused Plex to stop playing my videos. I have 4.5 and Plex both running fine. CodeexPack and Plex have no interaction with one another. Also the older version AFAIK cannot be run on the new QTS 4.3 since it is a 64-bit OS. If Plex stopped playing videos you probably have a Plex issue that has nothing to do with CodexPack as it doesn’t use or need it. Plex does it’s own transcoding and sadly has never used the hardware offload of QNAP or Synology. 4.3.0.1 works fine on QTS 4.3.3 for me. According to Plex, the issue with CodexPack 4.5 relates to those using the Multimedia folder. Unfortunately, I overlooked the Plex FAQ mentioning not to do so. Ah that would make sense. I don’t even use that folder I have a separate volume created just for Plex Media so explains the issue. Easy fix though. Just copy your data to a new folder, add that new folder to the Plex library rescan the library and you will get duplicate files for each movie. Then remove the old location from the library in Plex and your problem is solved. :). As long as you have enough free space to duplicate then remove you will be fine. I keep all my Plex Media off on it’s own volume so I can sync it and do other functions away from the default folders. If I could remove the default folders….I would. Also if you create a new folder, DO NOT mark it as a multimedia folder you will probably end up with the same issue. If you do not mind downloading all of your video’s metadata again, yes, that should solve the problem. If you have made alot of customizations to it or otherwise don’t want to redownload it again, then it is a little less clear. If you are using less than 50% of your drive, the following procedure is supposed to preserve your metadata. If you are using more than 50% of your drive you may be able to try a modified version of the above using move instead of copy but it is not clear to me if it will preserve your metadata. yes the link is basically what I was saying in more detail if you have space available to copy temporarily. I have done it before without a download. Honestly the download for me is no big deal. Only customizations I have is a few poster changes and I have 8TB and 500 files so I’d still be fine with a re-download. Understood, my last post was sent before I saw your edited reply to include more details. Good to hear you have done it before without a download. I am using more than half of my 8 TB drive but may give the procedure a try anyway using move instead of copy and just deal with redoing the few customizations I have made if the metadata needs to be redownloaded. I had the same problem with Plex once I upgraded to CodexPack 4.5.0. When I rolled back to 4.2.7, Plex could stream again. So there is something in that update that stops Plex from working, regardless of if they interact. I would be interested to find out what exactly that issue is and will update if I get it narrowed down. Mine has been on 4.5 since it was released and my PLEX is also current code available via PLEX pass download and no issues. It’s most likely something specific with your device or your Plex install. There is nothing that either of those use together. Also could be how you are addressing your PLEX volume and if CodexPack is using the same folders. There are a lot of variables but I have 4.5 installed just not using it for Video Station. I could actually just remove it. If you are running plex there is ZERO need for the CodexPack IMO. I don’t even have video station installed just use plex for all of that it’s a better product. Remove codexpack and see if plex works again. Stop and restart plex, re-install plex manually with QNAP downloads from QNAP site. Don’t ever use the QNAP posted version it’s months behind. Also do not REMOVE plex just install over it. if you remove you will lose all your library data. Came here to report, that as of 3/20/18, Transcode for files with AC3/DTS audio is STILL broken. Qnap is falsely claiming their products ability to perform a task that it cannot actually do. On the upside if you are running PLEX via the QNAP package then you can use the HW transcode capability. Has been there for a few months and seems to be working okay. Not that I’m aware of. Seems the root issue is that QNAP didn’t pay for licensing anymore. I’ve completely moved over to Plex with HW transcoding enabled there and CodeEX pack completely removed. I think that’s what most people have done as well. That’s sad TS-328 doesn’t support PLEX …..